See the front of file toolkit.js to see documentation on options or see the options selection form below. To install unpack the attached zip into a folder named 'XML Toolkit' under your GenoPro 'skin' folder. It should then appear in the list of skins in the GenoPro Report Generator. I have done limited testing but it has yet to be exposed 'in the wild' so use with caution. It produces a GenoPro compatible XML file with the changes in the specified Report folder. I recommend comparing the before an after XML files to check changes. First export your existing .gno file to an XML to serve as the reference. 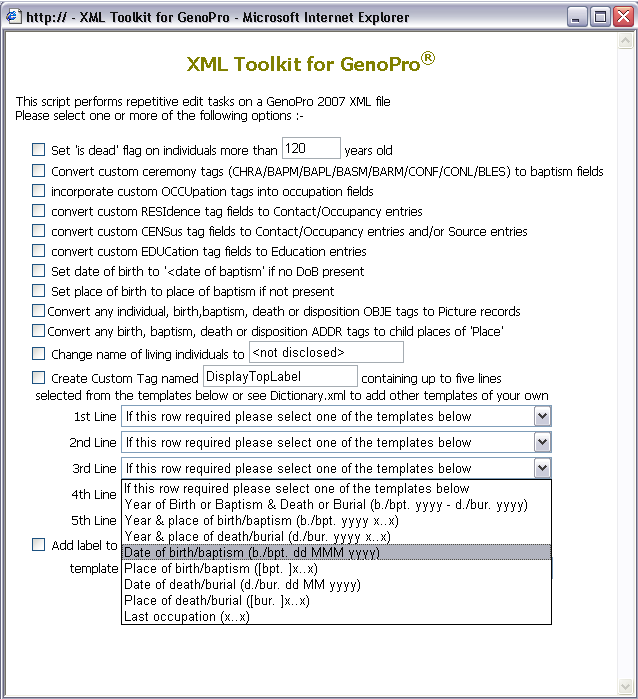 Run this utility and open the XML file produced with GenoPro. Check that it loads with no errors and visually verify the changes using GenoPro. Then export this new file as another new XML file (this will provide your data in the same format as your reference XML file). Then compare the reference XML file with this latter file with a utility such as WinMerge or WinDiff. (Google will find downloads for these if reqd). If you are happy with the changes you can then save the new XML file as a .gno file. Play safe a keep a backup of the original. I have taken the opportunity to revise the code to add birth comments detailing the particular religious event if it does not match those catered for by GenoPro. e.g. Blessing, First Communion, Bar-Mitzvah etc..
Error at line 359 (Toolkit.js) : 'length' a la valeur Null ou n'est pas un objet. I tried it again without trying to use the census or residence and occupations and it seems to have worked for the marriage lines and DOB s etc. Toolkit.zip contains three files - Config.xml, Dictionary.xml and Toolkit.js. Unzip toolkit.zip and place all three files in the folder 'XML Toolkit' in your skins folder. The Options tab of GenoPro's Generate Report shows where GenoPro looks for skin folders. I noticed that the zip 2 only had the js file in it which I had added to the skin folder. One point, the old system allowed to show the choice of full dates above the marriage line instead of just the year. Would it be possible to add this option ? Looks like you have a CENS tag without a DATE subtag. I didn't allow for this, a Census entry without a date would not be of much use. Version 2.0.0.b3 has the fix anyway, also a fix to prevent an empty CENS tag being left. I am using FireFox with the IE Tab loaded, so can not load Internet Explorer directly.